"The Ultimate Yma Sumac Collection"
Some may argue that Martin Denny or Les Baxter were the heart and soul behind the exotica craze of the 1950's, but when you look at it, no one can compare to Yma Sumac and her five-octave range. Her voice invokes a primitive South American paradise--at one moment it can soar over theAndes Mountains, and the next it can take you underneath the Amazon River. Sumac, a true-to-life Incan princess, was discovered in the mountain of Peru by musicologist, and future husband, Moises Vivanco. When she came to the United States, she was immediate success. Her first album, "Voice of the Xtabay" (released as a 10 inch in 1950) became required listening on hi-fi's the world over. Even today, you have not earned your hipster stripes unless you have that original 10 inch as well as the 12 inch record which combines "Voice of the Xtabay" with her second release "Inca Taqui--Chants of the Incans." Sumac's talents have won praise with classical and popular music fans alike. She has performed Peruvian folk tunes with the Bolshoi Symphony Orchestra as well as performed mambos with the Billy May Orchestra. She was able to give exotica the creditability it sorely needed. Bird sounds and jungle drums are nice, but easily dismissed as a goofy novelty unless you have the actual talent to infuse the music with a sense of authenticity. Sumac had that in spades. 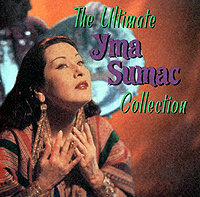 "The Ultimate Yma Sumac Collection" gathers up 21 tracks spanning the vast range of styles she performed during her career. From folk song to pop song, you can't help but get caught up in the mystery and exotic-ness of her multi-octave voice.